Hey God, I'm Starving in This Den, So Why Won't You Let Me Eat This Guy Named Daniel?! 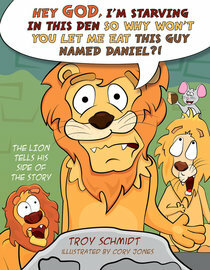 gives children ages 4 to 8 a new way to learn about Daniel and the lions that is roaring good fun. About "The Lion Tells His Side of the Story: Hey God, I'm Starving in This Den So Why Won't You Let Me Eat This Guy Named Daniel?!"